“YALTA, CRIMEA/KYIV — From the 16th-century Tatar Khans’ palace in Bakhchisaray to the former tsarist residence that hosted the World War II Yalta conference, Crimea’s heritage sites have become a source of bitter contention since Russia seized the region from Ukraine. For Kyiv, which does not recognize Moscow’s annexation of Crimea, losing the cultural and historic legacy of the Black Sea peninsula would be another major blow and Ukraine is readying for long legal battles with Russia. “We will never give up the valuable heritage in Crimea because that is the property of Ukraine,” the country’s prosecutor general, Oleh Makhnitsky, told Reuters on Wednesday. Ukraine’s Culture Minister, Yevgen Nishchuk, said Kyiv was amending its laws to seek justice internationally should Russia start removing cultural goods from Crimea or take over formal supervision of the region’s heritage sites. One exhibition, put together by five museums – including four in Crimea – and currently on display in Amsterdam, has already fallen hostage to the conflict over the region, the worst stand-off between Russia and the West since the Cold War. Both Crimea’s pro-Russian authorities as well as Kyiv claim ownership of the exhibition, titled “Crimea – Gold and Secrets of the Black Sea”, which features golden artifacts and precious gems dating back to the fourth century BC. The show is operated by the University of Amsterdam and spokesman Yasha Lange said a legal investigation was going on to determine to whom the collection should be returned after it closes at the end of August. “The exhibition should return to Crimea,” said Valentina Mordvintseva, who works for Ukraine’s National Academy of Sciences in Crimea’s provincial capital of Simferopol and who helped Amsterdam’s Allard Pierson Museum set up the exhibit. She was referring to a March 16 referendum in Crimea, an impoverished region of two million with a narrow ethnic Russian majority, which yielded an overwhelming victory for those advocating a split from Ukraine to join Russia. Kyiv and the West dismissed the hastily arranged vote as a sham but Moscow used it to justify formally incorporating Crimea on March 21. Crimea has since then introduced the Russian ruble as its currency and switched to Moscow time, while Russian troops have taken over Ukrainian military bases, forcing Kyiv to pull out its soldiers with their families. Prosecutor Makhnitsky said the Justice Ministry in Kyiv was preparing to register lawsuits with international organizations to assert its rights to the historic and cultural sites in Crimea. The ministry refused immediate comment on what exactly it plans to do, but any such endeavor is likely to be an uphill battle as Russia controls the region. Underscoring how any efforts from Kyiv could face further obstacles, some directors of Crimea museums have welcomed unification with Russia in the hope it will lead to increased budget support from Moscow. Valery Naumenko, director of a museum housed in the historic residence of the Crimean Khans in Bakhchisaray, complained that Kyiv had not allocated any funds for the upkeep of the palace, which is dominated by two slender minarets. “Ukraine has no resources and no moral right after these two decades to put up a bigfight over Crimea’s heritage,” he told Reuters. 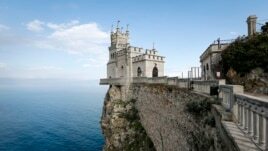 A general view shows the Swallow’s Nest castle overlooking the Black Sea outside the Crimean town of Yalta, March 28, 2014. “The sooner politicians and culture workers in Kyiv understand that, the sooner life in Crimea and Ukraine will improve,” he said. 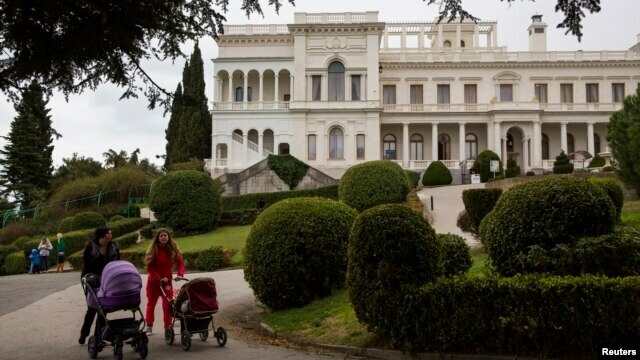 In the elegant Livadia Palace in Yalta, director Larisa Dekusheva said she hoped to see more Russian tourists, now that Moscow has said it is determined to make Crimea a more popular holiday destination. The white stone palace, sitting on a slope with spectacular views over the Black Sea, was the last residence built for the tsars before the Bolshevik Revolution in 1917 and served as a tuberculosis sanatorium afterwards. In February 1945 the site hosted the seven-day Yalta Conference, when Stalin, Churchill and Roosevelt made key decisions on the post-war order. “It was originally the property of the Romanov family, that is of the tsars of Russia,” Dekusheva added, saying Moscow had historic rights to the palace and Kyiv should not seek any compensation. Crimea’s new government has angrily dismissed any talk of potential compensation claims for the property it nationalized in separating from Ukraine.